Budgeting is the single biggest tool you have to take control of your money, achieve your financial goals, and set yourself up for long-term success. Yet it's not always a given. If you're having trouble getting on board with budgeting, think of it like using a fitness tracker. You use a fitness tracker to help you lose weight. So why wouldn't you use a budget to successfully cut back on your spending, reach a long-term financial goal, or pay off debt? Still not convinced? A budget can help you get your financial situation under control. Once you do that, it is a lot easier to find the time to do things that you love. Another bonus? You'll truly be able to enjoy that massage, European vacation or new home if you're not stressed and worried about money. 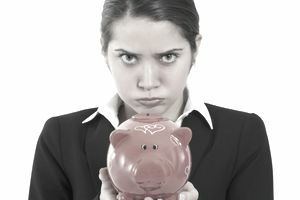 Below are five excuses commonly used to get out of budgeting, and how to get past them. One of the most common complaints about budgeting is that it takes too much time. And it's fair. Sitting down and writing out the budget is just the first step in budgeting. Tracking your spending, budgeting meetings, and clipping coupons all take time. It can be time-consuming to budget, especially the first few months as you get the hang of things. Avoid this excuse by finding a good budgeting system that works for you, such as an iPhone budgeting app. It helps if you can enter your purchases when you make them on your phone. This means that you only have to take a few minutes at the end of the day to glance at how you are doing spending-wise, plus a monthly budgeting meeting, which should take an hour, tops. Another common reason people do not budget is because they feel too broke to budget. It can be scary to write down all the money you have going out each month and realize that you do not have enough cash flow to cover it. Many people forgo a budget and simply hope that things will magically work out. If you are in this situation, it is essential that you budget so you can make the best choices with your money. A budget can also help you see areas you can cut back and make choices to change your situation so you can free up some much-needed cash. This budgeting excuse is fairly common. Many people simply do not like the hassle of tracking their spending every day and seeing how much they have left. It can be time-consuming and stressful to always have to check on how much you have in each category. The envelope method is a great solution to this problem. You use cash for the majority of your categories and when the cash is gone, you know you cannot spend any more. For some categories, you may want to divide it by week, so you can ensure you still have enough cash to cover necessary expenses (think grocery money or gas) at the end of the month. The envelope method can not only help you to stop blowing your budget at the beginning of the month, but it can also help you get over an aversion to budgeting since when followed correctly, this method ensures you always have cash when you need it. If you are married or in a committed relationship, it can be difficult to start budgeting if your significant other is not on board. But there's a workaround for this issue. You need to only combine the household expenses, and create a household budget that dictates what each partner much contribute monthly. Some couples determine this amount based on a percentage of their respective incomes, others simply split it, 50-50. Either way, even if your partner doesn't want to budget, you can still stick a personal budget and work toward your financial goals, such as investing or saving for retirement. Worth noting: if you and your spouse are not able to agree on major issues such as spending, budgeting, and household expenses, you may consider counseling. Another reason that people avoid budgeting is the way it makes them feel. Budgeting can elicit feelings of deprivation and not getting what you want, which can be tough. There are other feelings that get in the way of budgeting, too. Some people like the high and rush that comes from shopping. If you have this issue, you may need to get help for spending issues. Other people feel frustrated because the budget does not work out the first month or two and then they give up. In this case, it's important to remember that budgeting isn't easy, and definitely takes some getting used to. Do not give up or get discouraged, keep trying and adjusting and eventually budgeting will get easier. If you do not want to budget because it makes you feel like you do not have enough to do the things you want, then you need to change your situation. Paying down your debt and looking for a higher-paying job can help you do this.